Sullivan “Sully” Caliber (from Eben Burgoon‘s B-Squad, left), Eben07, Long John. Today marks the day I started making comics for the world to see. 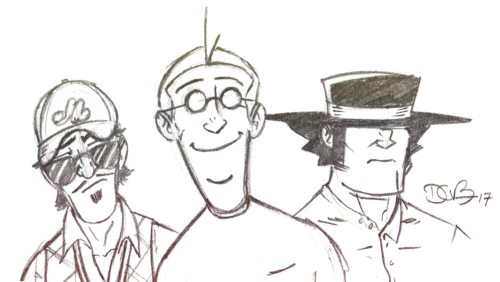 It was 2007 and fellow creative, Eben Burgoon, and I took characters we created in high school and developed a rather thoughtful, if absurd, world around them, turned them into secret agent janitors, and started posting comics of their exploits as Eben07 to the internet. My first ever comic, published ten years ago today, with Eben Burgoon. Ten years later, Eben and I have gone our separate ways, but we’re both making comics still and using the footing we found as co-creators of a silly action comic to forge our own paths; he with B-Squad, I with Long John, of course. I wish I could say that I feel like a seasoned professional, but I am decidedly not. I continue to brace against the centrifugal force of the learning curve I’m still riding, assuming that it will level out at some point in the future. Perhaps it doesn’t, maybe it’s not a straight line to this thing called “expertise.” Maybe it’s a tight spiral all the way forward and we’re always fighting against the gravity of ourselves, as creatives, and the audience, as consumers. 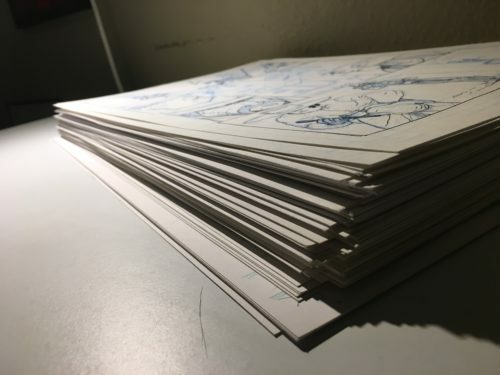 All of Long John so far, including unfinished pages for Chapter 3. Cat hair for scale. It’s a fun ride, though, and I plan to keep doing it for as long as there is a road, no matter if it’s curved or straight.